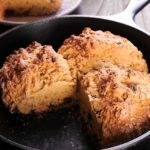 Delicious quick bread in 30 minutes! Soak raisins in whiskey for 1 hour in a medium bowl. In a mixing bowl, add flour, soda, sugar and baking soda, and whisk the dry ingredients together. Drain raisins and add them to the dry mixture. Pour in buttermilk into the mixing bowl with the dry ingredients. Using hands, mix until well combined only for a couple of minutes (do not overwork or knead the dough). Form into a ball and place on a cast iron skillet, greased baking sheet or dutch oven. Using the knife, cut the bread all the way down into four equal parts in an "X" shape. This will ensure proper and fast baking. Four separate parts will connect as the dough expands in the oven. Sprinkle with Turbinado sugar. Bake for 30 minutes or until outside is browned.